I don't remember exactly when I started wanting to sew again. I know it was sometime last summer, and it had a lot to do with reading SouleMama and Angry Chicken. I've tried several times over the years to learn. I was obsessed with quilting in college - I even did my senior thesis on the history of quilting (I was a history major). My grandma was trying to teach me how to make a simple pillow-squared quilt when she passed away (it's still unfinished). My parents gave me a sewing machine for Christmas in 1996, and I used it to make a pair of flannel pajama bottoms (it was the 90's!). And I took a quilting class in the fall of 1997 (that quilt is also unfinished). My sewing machine sat at my parents' house waiting for me all these years. So last summer, I got excited about sewing again, but my machine lived 450 miles away from. I talked hubby into bringing it home with us from a visit, but I was still scared to touch it. In fact, he did all the machine sewing on the chocolate chip cookie costume! I read Bend the Rules Sewing by Amy Karol (angry chicken) about 500 times trying to psyche myself up. I had sewing projects cut out, waiting to be made into Christmas gifts. One night, I couldn't take it anymore, walked into the guest room (where my machine hangs out), and started an artsy clutch for my mom's mp3 player. It's mostly straight lines, so I thought it could be simple. 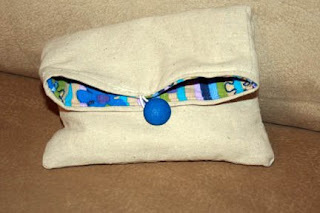 Let me say, the artsy clutch is the perfect first project! My husband wasn't sure I was doing it right, but when I turned it right-side out, suddenly there was a purse. It was amazing (turning projects right side out is my favorite part). I'm not entirely sure what this one is made out of: I found both fabrics in the remnant pile at Hancock's. The inside is a fun, bright, soft corduroy. The outside has a linen feel to it, but I'm fairly sure it's made of cotton. I'm not yet familiar enough with fabric to place it. The button is from my button stash, and I suspect that it came from some of my grandma's clothes (my mama's mama) which made it extra-special. I've decided to share my projects in an ongoing series called "Sew Fun." (Yeah, I know, but puns are fun and that's the whole point of this blog!) They'll be easy to locate in my blog topics. Cute! I love that moment when you turn it right side out and it suddenly takes shape. These artsy clutches are a fun project. I am impressed! I hope you continue to have some time to sew - easier said than done I know, but such a cool skill to have.